As promised, this entry addresses two final questions about the difference between agave nectar and sugar: 1) whether it tastes different and perhaps better in some applications and 2) whether it’s a good way to cut calories because it’s sweeter than sugar. The answer to both is yes in theory, but not really in practice. I decided to use agave syrup, a more flavor-neutral sweetener that can be found in natural food stores. However neutral, as long as it’s different, I’m willing to accept the possibility that it might taste better in some applications. But based on the Derby Day taste test, mint juleps aren’t one of them. The consensus was that the agave nectar drink was deeper, more complex, had a longer finish, and was more tequila-y (in the sense of blanco tequila), than the simple syrup one. The simple syrup was deemed cleaner and fresher tasting. Three people said they outright preferred the agave nectar until Nils said, “It depends, during the daytime or at the beach I’d prefer the simple syrup, at night at a bar or with food I want the agave.” Everyone could agree to that. They used a refractometer to make sure the amount of sugar in the two mixtures was the same, which required them to water down both the agave and simple syrups (4:1 water:syrup). Their mixes contained the same amount of tequila, lime juice, and ice, but the simple syrup one contained 22 g more water (about 3/4 oz) based on the refractometer’s measure of how much sweeter agave was. Not perfectly controlled, but I agree that you wouldn’t really expect 3/4 oz water distributed over multiple taster portions to affect the taste much. “Deeper” was also how the friend who hosts the annual Derby Day party (and makes some of the best fried chicken I have ever had) described the agave-sweetened mint juleps he had had in the past. So my expectation—the hypothesis of this little experiment, I suppose—was that agave nectar is sufficiently different in taste from sugar to noticeably affect and perhaps improve the taste of cocktails. In advance of the party, my friend made a simple syrup that was 1:1 white sugar:water and steeped a bunch of mint leaves in both that and about 12 oz. agave nectar. Neither of us has a refractometer, but the bottle of agave claimed that it should be substituted for sugar using a 3:4 ratio. Since it wasn’t diluted at all, it was substantially more viscous and sweeter than the simple syrup. There was some discussion of diluting the entire pitcher and then measuring out the cocktails very carefully with 3/4 as much diluted agave syrup as simple syrup and marking glasses randomly and having people fill out ballots. But in the end that seemed like too much effort and possibly still not completely controlled, so we decided just to let people mix their own drinks to taste. I prepared a side-by-side test by pouring about 1/2 oz of simple syrup into one cup and about 1/4 oz of the agave syrup into the other, diluting the agave to about the same level as the simple syrup, topping both with about 3x as much Jim Beam as syrup, and trying to add about the same amount of ice to both cups. This was in no way a controlled experiment. However, once mixed, there was no visually-apparent difference between the two. I knew I had gotten a few more mint leaves in the agave-sweetened one, but to anyone else, it would have been basically impossible to distinguish. I took a sip of each and couldn’t tell any difference at all. So I had two other people taste them, without telling them which was which—including the host who had claimed that agave made for a “deeper” drink, and they couldn’t tell any difference or identify which was which either. It was even almost a double-blind because I kept losing track of which one was in which hand and having to peer into the glasses to compare the number of mint leaves. The syrups themselves definitely tasted different, although the difference is difficult to describe—the flavor of the agave is almost a little caramelly, not as different from white sugar as brown sugar is but comparable to turbinado or “raw” sugar. Also, the sweetness seems thinner or purer than the sweetness of sugar, although that may be entirely the product of my expectations for how fructose might taste different than sucrose. Still, the fact that we could taste the difference in the syrups despite the fact that both were steeped in mint suggests that what masked the taste difference in the cocktails was the bourbon, ice, and/or dilution of the sugars in water. Although agave is more viscous than simple syrup, it dissolves even in cold drinks much more easily than granulated sugar. That might be better grounds for a defense of its superiority than the difference in flavor: agave might be a way to make drinks sweet without diluting them as much as you do when you add simple syrup. However, if the issue is dilution, you should be able to get the same effect by making a less dilute simple syrup, if necessary, by cooking it down. Cooking it could also produce caramelization, which might mimic the flavor of agave for applications that might benefit from that; using turbinado sugar might have the same effect. And either of those options might be worth considering if you really think agave tastes better but you’re at all concerned about your liver. However, in general, I think the difference in flavor and concentration of sweetness is not likely to be significant enough to outweigh the potential health risks. Fructose is sweeter than any other naturally-occurring carbohydrate. According to Wikipedia, pure fructose is about 1.73 times sweeter than sucrose. That may call into question the Cooking Issues refractometer, or their use of it to control for sweetness, because it judged their agave nectar to be 1.77x sweeter than the simple syrup. Agave nectar is supposedly between 56-90% fructose and 8-20% glucose, so it should never be sweeter than fructose. 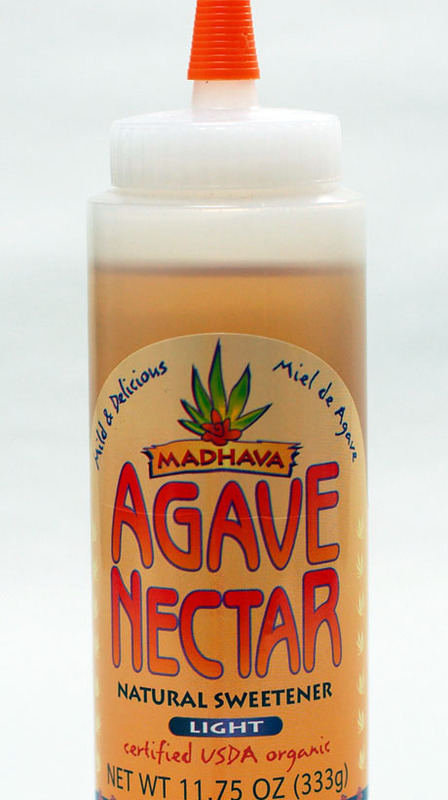 Madhava says its agave has approximately 1.4x the sweetening power of sugar, which seems far more likely. I’m not super familiar with refractometers, but from what I can tell, they measure sugar content and not the type of sugar, so something with a lot of lactose could still get a high reading even though it wouldn’t taste nearly as sweet as something with the same concentration of glucose, sucrose, or fructose. So another possibility for the perceived difference in the Cooking Issues taste test might be that the agave-sweetened margaritas were less sweet and that’s why they tasted more like tequila, deeper, and more complex. Anyhow, the caloric content of agave nectar varies based on the plant it comes from and the method used to hydrolyze the inulin, but in general, 1 Tablespoon contains 60 calories whereas 1 Tablespoon of sugar contains 45 kcal. That’s largely a difference of density—a tablespoon of agave is 21 g (part of that is moisture, but Madhava claims that 77% is solids, so that’s 16.17 g) and a tablespoon of sugar is only 12.5 g. Most of the suggested substitutions I’ve seen, including the one on the Madhava site and the back of the bottle we used for the mint juleps, call for 3/4 cup agave nectar for 1 cup of sugar or honey. 3/4 cup agave (252 g total; 194 g solids) @ 60 calories/T = 720 calories, which is exactly the same as 1 cup sucrose (200 g) @ 45 calories/T. So if you follow the manufacturer-recommended substitution, there are no caloric savings. It’s possible that the 3/4 cup agave = 1 cup sugar is an incorrect substitution. Given that fructose is sweeter than glucose, you should be able to use less agave than sugar (based on the weight of the solids, not just volume) to achieve the same level of “sweetness.” However, the nutritional information of agave-sweetened products vs. their sugar and HFCS-sweetened alternatives also suggests that in practice, people end up using the caloric equivalent rather than the sweetness equivalent. Wholemato Ketchup, which is sweetened with agave, contains 15 calories per 17 g serving, which is 5g less than sugar-sweetened Hunts, but exactly the same as HFCS-sweetened Heinz. From what I remember, Hunts actually tastes sweeter than Heinz, which may account for the difference between the two “normal” brands; having never tasted Wholemato and being somewhat disinclined to buy it, I can’t say whether it’s sweeter than Heinz or not. Nonetheless, no real savings here either. So yes, in theory you can save around 12 calories per serving (or more for very sweet drinks and desserts; 1 T is just the “serving size”) by using agave nectar instead of sucrose or HFCS. But in practice, it’s not clear that that actually happens, and you definitely shouldn’t be misled by the difference in the volume of the recommended substitution. 3/4 cup agave is calorically identical to 1 cup sugar. Also, none of that changes the fact that it’s probably nutritionally worse. The first, perhaps obviously, is the shape. There are at least four different theories about the origin of the word “bagel,” and all of them refer to the shape (etymology notes below the recipe for fellow word geeks). However, you can’t just make a standard bread dough into rings, throw it in a hot oven, and expect it to develop the glossy crust and dense, chewy interior that most people associate with bagels. The second difference is an issue of method: bagels are traditionally boiled before they’re baked, which causes the surface starch to gelatinize, producing their characteristic smooth, shiny crust. The same is true of pretzels, which originated in the same region and, according to Maria Balinska, who wrote a 2008 book about the history of the bagel, are probably related. She specifically calls them “cousins,” whatever that means in terms of food history. She also notes that the Polish obwarzanek—another boiled, ring-shaped bread often sprinkled with sesame or poppy seeds—is an “older and Christian relative,” so perhaps that’s the spinster aunt who devoted herself to Jesus. Google translates the Polish entry on “Obwarzanek” to “Bagel,” and this travel guide refers to them as “pretzel rings.” I’m sure different people have different ways of distinguishing between the three, but the boil-then-bake method they share probably makes them more alike than different. So, for example, some people might think pretzels have to be shaped like folded arms whereas other people accept rods or rings as “pretzels,” but either way they’re formed from ropes of dough that maximize the surface area exposed to the boiling water, just like their relatives. The third difference is an ingredient—bagels are the only bread I know of whose recipes frequently call for malt extract. Pretzel recipes occasionally include it, but not nearly as often as bagel recipes, many of which claim that the malt extract is the key to making “authentic” bagels or achieving a truly “bagel-y” flavor. I can’t count how often expatriate New Yorkers would stop me on the street with tears in their eyes, telling me that mine were the best bagels they’d had since they left "The City," and that they were better than most in "The City" these days. The reasons are simple. I didn’t cut corners and used good ingredients. I don’t know why so many bakeries cut corners on making bagels these days, it’s really NOT that hard! But I think it’s more likely that the idea of the superior New York bagel is primarily the product of nostalgic fantasies and social decline narratives—it’s something that never was and tells you more about contemporary anxieties and desires than anything real in the past. The tears in those expatriates’ eyes say more about contemporary feelings of depthlessness and transience, the desire for connections to the past and a sense of community, and the myriad dissatisfactions that make people want to think everything was better in the “good old days” than what makes a bagel delicious or “authentic” to anything. We wouldn’t dream of making bagels or kaiser rolls without barley malt extract, and neither should you! Barley malt extract improves the taste and texture of the breads it is used in. It goes by a number of names. barley malt extract and malt extract among them. If a malt extract doesn’t specify what grain it is made from, chances are pretty good it was made from barley. Barley is a grain used mostly in brewing beer and making Scotch Whisky. IBarley makt [sic] extract adds a nice taste to breads where it is used. For our recipes, you can either liquid or dry, diastatic or non-diastatic malt extract and not worry about changing the recipe, any combination of these will work just fine. The important things to avoid are hopped malt extract which is really only useful for making beer and the malted milk powder sold in many grocery stores as a milk flavor enhancer which has too little malt in it and too much sugar. Malt extract is basically just sugar made from grain, usually starting with barley. According to Harold McGee, it’s “among the most ancient and versatile of sweetening agents, and was the predecessor of modern-day high-tech corn syrups.” Just like corn syrup and agave nectar, malt extract is produced by breaking starches into their constituent sugars. Rather than adding enzymes or acids, malting works by simply germinating or sprouting the grain. As a grain germinates, it produces enzymes that digest the grain’s starch to fuel its growth. Those enzymes can be dried and mixed with cooked grains (usually rice, wheat, and barley), which they can also digest, producing a sweet slurry containing lots of glucose, maltose (glucose+glucose), maltotriose (glucose+glucose+glucose), and some longer glucose chains. It’s not as sweet as sugar, but before sugar colonialism, it was one of the primary sweeteners available in Europe and Asia (the other two were honey and molasses made from sorghum). According to McGee, it was the primary sweetener in China until around 1000 CE, and is still used in China and Korea for confections and the sweet, caramelized gloss on dishes like Peking Duck. Malt extract is also still frequently used in beer brewing—a friend who does home brewing told me recently that American brewers are especially likely to use it to adjust the alcohol content of their beers midway through the brewing process. Apparently the laws regarding how closely the alcohol percentage matches what’s on the label are fairly strict and as the sugars in malt extract are highly available to yeast, it’s a good way to increase the yeast activity quickly and reliably. McGee claims that malt extract is “frequently used in baking to provide maltose and glucose for yeast growth and moisture retention,” and that might be true for commercial bakers, but it’s not available at most grocery stores, where home bakers get their supplies (it can be found anywhere that carries home brewing supplies and many “natural foods” retailers, including some Whole Foods). However, before sugar was readily available and cheap, it seems likely that malt extract was used the way other sugars often are today—to speed up yeast activity, enhancing rise and oven spring—in many kinds of bread, not just bagels. Some bagel recipes call for other sugars in place of the malt extract in bagel dough—the first recipe I tried called for maple syrup, perhaps because of it’s phonological similarity to “malt syrup,” the liquid form of malt extract or because they’re both liquids, though malt syrup is much thicker—closer to unfiltered honey. Recipes that call for “malt powder” but also recommend a sugar substitution generally call for brown sugar. And I found at least one that suggests malt powder, malt syrup, honey, and maple syrup are all interchangeable. Of course, they all have slightly different flavors, but most recipes only call for 15–20 g for ~8 bagels so any affect the sweetener’s flavor has on the final product is bound to be minimal. It’s been a while since I made the maple syrup batch, but I honestly didn’t notice any major flavor difference in the batch pictured above, which used malt extract. Perhaps part of the problem was that I used a “wheat” malt, which may not have as malty a flavor as barley malt. But, again according to McGee, even when it starts with malted barley, “malt syrup has a relatively mild malt aroma because the malted barley is a small fraction of the grain mixture.” In short, despite what some recipes say, you shouldn’t let your lack of malt extract stop you from making homemade bagels. Nonetheless, it’s still a mystery why bagel recipes would be more insistent about using malt extract than any of the other breads descended from European varieties developed before sugar colonialism. Why are people so willing to substitute sugar in everything from soft, buttery brioche to pretzels, bagels’ closest cousins, but fanatics about the importance of using this particular Old World sugar to certify the authenticity of the bagel? My theory is that it has to do with the bagel’s iconicity and association with Jewishness. One story about the origin of the bagel that seems plausible (though Balinska lumps it with the story about stirrups—explained in the etymology note at the end—as speculative at best and possibly fictitious) is that it’s another version of the ubiquitous roll-with-a-hole developed by Jewish bakers in Krakow after a decree limiting baking or trade in flour to the bakers’ guild was lifted. Even in Poland, which from its founding was more tolerant to Jews than most countries in Europe, Christian trade and craft guilds in many cities excluded Jewish merchants and artisans, who sometimes formed their own guilds. The travel guide’s description of Obwarzanek claims that King Jan Sobieski lifted the ban in 1496, but he didn’t rule until the 17th C. Other claims that Jan Sobieski lifted the ban in the late 17th C. are problematic because the Yiddish word “beygel” was already in widespread currency in Krakow by 1610. There was a different King Jan in 1496—Jan I Olbracht or John I Albert—whose reign was also notable primarily for wars against the Turks. Perhaps he lifted the ban, and Jan Sobieski’s greater fame and friendliness to Poland’s Jews sort of absorbed the earlier Jan’s bagel-inspiring or enabling acts? On leaving the oven the baked goods have a sell-by date of about three hours. As such, finding a hot one is essential. Enjoyed by people of all ages, obwarzanki also feed Kraków’s entire pigeon population when in the evenings the city’s 170-180 obwarzanki carts essentially become bird-food vendors. It is true that in the 1890s in the United States only Jews from Eastern Europe ate bagels. In thousands of nondescript bakeries—including the one founded in New Haven around 1926 by Harry Lender from Lublin, Poland—Jewish bakers sold bagels to Jewish consumers. The bagel was not a central culinary icon for Jewish immigrants; even before Polish and Russian Jews left their ethnic enclaves or ghettoes, their memories exalted gefilte fish and chicken soup prepared by their mothers, but not the humble, hard rolls purchased from the immigrant baker. As eaters, Jewish immigrants were initially far more concerned with the purity of their kosher meat, their challah, and their matzos, and with the satisfactions of their sabbath and holiday meals, than with their morning hard roll…. They became firmly identified as “Jewish” only as Jewish bakers began selling them to their multi-ethnic urban neighbors. When bagels emerged from ghetto stores as a Jewish novelty, bagels with cream cheese [which, as she elsewhere notes, was initially developed by English Quakers in the Delaware Valley and Philadelphia in the eighteenth century] quickly became a staple of the multi-ethnic mix that in this century became known as “New York deli,” and was marketed and mass-produced throughout the country under this new regional identity. Authentic or not, this recipe is delicious and fairly easy. Like most yeast breads, it takes time, but not a lot of active time. You can use any combination of flours you want, but if you want a really chewy crust and crumb, you will need a high proportion of protein. Some recipes suggest “high-gluten” bread flour, which has an even higher percentage of protein than bread flour. King Arthur claims their “Sir Lancelot” flour is the highest-protein flour currently available for retail sale at 14.2% protein. I just used regular bread flour (10-12% protein), whole wheat bread flour (up to 14% protein, although the additional fiber seems to limit gluten action which is also why I didn’t make them with 100% whole wheat flour), and added approximately 1 T. vital wheat gluten per cup of flour (including the flour in the starter). Even if you just used all-purpose flour, they would probably still be good, just less chewy. You can add more of any kind of sugar or whatever else you might want in them—dried fruits, nuts, chocolate chips, chopped spinach, grated cheeses, etc. And you can top them however you like—I used kosher salt for some, sesame seeds for some, and a combination of bits of fried garlic, fried shallot, black sesame seeds, and kosher salt, kind of like one version of an “everything” bagel. I think they’re best fresh out of the oven, slathered with butter, but true to form, they’re also good plain (and easy to stow in a bag for a convenient snack) and on days 2 and 3, they’re great toasted. toppings—sesame or poppy seeds, salt, fried garlic or shallots, finely grated hard cheeses, etc. 1. Whisk together flours, gluten, and malt extract if using. Add starter, water, salt, oil, and maple syrup. 2. Mix until they begin to form a dough. Turn onto a lightly floured surface and knead for about 15 minutes. If you have a mixer or processer with a dough hook, you can use it for this step. Gluten development is pretty important if you want chewy bagels, so it’s worth checking for the baker’s windowpane. 3. Cover and let rise 3-4 hours, or until doubled. You can let it rise longer and nothing bad will happen, although the sour flavor will become more pronounced over time, and positively sourdough-like after 12-15 hours. You can significantly retard the rise by refrigerating the dough. 4. Divide the dough into 8-12 equal pieces. If you want to be especially particular, use a scale. Eight will be ~155g each, ten will be ~125g each (the size I made), twelve will be ~105g each. Shape them either by poking a hole in the middle of a round and stretching it out or rolling the dough into a rope 9-12 inches long, and pinching the ends together. In my experience, the latter makes for a slightly more consistent thickness. 5. Let rise another 3 hours (30-45 min. if using instant yeast) or cover and refrigerate overnight or up to a week, and remove 1 hour before you’re ready to bake to let them come back to room temperature (so if you want fresh bagels in the morning, you need to make the dough by the afternoon before). 6. When ready to bake, preheat the oven to 400F, boil a large pot of water with 1 tsp. baking soda dissolved in it, and put a couple tablespoons of any toppings you want into bowls. 7. When the water is boiling, carefully place 2-3 bagels at a time (more if the pot is large enoguh that more can float in the pot without touching) and poach them for 1 minute on each side. Remove them to a colander and then, while they’re still wet, place them in one of the bowls of toppings. 8. Bake for 20-25 minutes, or until browned. Rotate pans half-way through if your oven is uneven. Several sources, including a 1993 New York Times article and a 2006 book titled Bakery Products: Science and Technology, refer to a popular myth that bagels were invented by Jewish bakers in Vienna as a tribute either King John (Jan) III Sobieski or a King Jan (John) Cobleskill of Poland after he saved the city from Turkish invaders in 1683. The King’s favorite hobby was horse riding, so they shaped the rolls like stirrups, the German word for which is “bugel” (the Austrian word is “beugel” which may be the origin of the first faux-etymology). However, a letter to the editor demanded that “that piece of fakelore be laid to rest,” noting that Yiddish word “beygl” appears in the communal rules promulgated by the leaders of the Cracow Jewish community in 1610: “The rules stipulate that bagels are among the gifts which may be given to women in childbirth and to midwives.” Furthermore, the word appears in the rules without any definition or explanation, suggesting that it was already well-established by the early 17th C.
Two that seem more likely: According to FoodReference.com, the Oxford Companion to Food (1999) says the word comes from “bugel,” not the German word for stirrup, but the Middle High German word for “ring or bracelet.” And in Jewish Cooking in America (1994), Joan Nathan claims that the word derives from “biegen,” the verb meaning “to bend.” Both “bugel” and “beigen” are derived from the Old High German “biogan,” meaning to bow, bend, or curve and the related root “boug-,” which in turn is descended from the Proto-Germanic “beugan” (which, incidentally, also gives us the Old English root “beag” or “beah” which also refers to a ring—“usually meant for the arm or neck; but in one case at least used of a finger ring” OED). So that Germanic root for all things bendy and ring-like is likely the origin of the Yiddish word that was in wide use in Poland by 1610. In the first post on agave nectar, I focused primarily on why it’s no more “natural” than high-fructose corn syrup, which is a delicious irony given how both sweeteners tend to be portrayed. But that isn’t necessarily a reason to avoid agave nectar. “Natural” is at best an imperfect heuristic for healthiness or environmental friendliness, and has no inherent relationship with deliciousness. But, as I also suggested in the first post, agave nectar is certainly no better health-wise than other sources of sugar, and the fact that it’s much higher in fructose than most sweeteners (70-90% vs. ~50%) gives me reason to believe it may actually be worse for your health than sucrose or HFCS-55. So Don’t Drink the Agave-Sweetened Ketchup Either. Because That Would Be Gross. This ketchup forgoes the high-fructose corn syrup and uses agave nectar, preserving sweetness without clobbering your fries or hot dog with liquid candy…. Slather it on your sweet potatoes as an alternative to a fatty slab o’ butter. Note: The review is only available on the Wholemato site because the “read more” link is broken, but I’m not inclined to think it’s a fabrication as the other links on their “buzz” page are legit and you can find nearly-identical, equally-apoplexy-inducing claims about Wholemato Ketchup at The Kitch’n, Girlawhirl, i like granola, and Well Fed Man, among others. Jennifer: I went sugar-free at 16 to help my psoriasis & still don’t have it, 8 years later . Nicole: I have to admit that in the first few weeks I baked a lot using ingredients like honey, agave and brown rice syrup. Cookies are my favorite to make, and I have a long list of recipes on my blog to the right. I also drank a lot of flavored tea with honey added and that seemed to cure some of my cravings. Beth: I stopped eating sugar last year and its worked out pretty well. As long as I can have natural sugars which are found in fruits, then I’m totally satisfied. Not All Things That Occur Naturally In Fruit Should Be Consumed In Quantity. Like Cyanide. [. . .] you say Agave is 70% fructose, ok, so that means that means a teaspoon of Agave (about 4 grams) has about 2.8 grams of fructose… Hmmm, a small tomato has about 2.6 grams of fructose in it, the same as a carrot!… so, by your ridiculous logic, you should run away from tomatoes and carrots as fast and as far as you can! OMG, never eat another tomato! And don’t even get me started on Apples! I would trust the Mayo Clinics recommendations as regards to High Fructose Corn Syrup… it is poison. But really, Apples, Carrots, Tomatoes etc all bad for you? Stop it. It’s actually not illegal to call HFCS “natural.” The FDA has been notoriously unwilling to define “natural” aside from the essentially meaningless distinction between “artificial” and “natural” colors and flavors—which Eric Schlosser talks about extensively in Fast Food Nation (pp. 121-131). As of July 2008, HFCS is “natural” for the purposes of food labeling. You can read all about the ongoing legal debates here. However, that hasn’t stopped people from trying to differentiate “natural” fructose, like the stuff in fruit, from “chemically-produced” fructose, like the stuff in HFCS. The problem is that they can’t seem to agree which side the fructose in agave nectar is on. 1897 Allbutt’s Syst. Med. III. 386 Cane sugar is partly left unchanged, partly converted into glucose and lævulose. 1902 Encycl. Brit. XXII. 721/1 Glucose and fructose (lævulose)the two isomeric hexases of the formula C6H12O6 which are formed on hydrolysing cane sugar. 1974 Nature 10 May 194/3 Although it is true that some bacteriologists are extremely conservative in the names they use for carbohydrates, surely nobody now uses ‘levulose’…in preference to ‘fructose’ these days. A PubMed search for “levulose” also turned up 30,398 articles about (surprise!) fructose. The twenty articles that actually had “levulose” in the title were almost all translations, mostly from German. So no, there is no difference between “naturally occurring” and “chemically-produced” fructose (and if the fructose in HFCS is the latter, so is the fructose in agave). Nonetheless, Dave and Rami Nagel are both at least partially correct. Fructose/levulose may not contain enzymes, vitamins, minerals, fiber, and fruit pectin, but the fruits that contain levulose/fructose certainly do. And there’s no reason to believe that eating a small amount of agave nectar, say a teaspoon, with similar amounts of fiber, protein, and other nutrients as would be found in a tomato or carrot would have a different or worse effect on the body than the vegetables themselves. Just because fructose isn’t necessarily bad for you in the amounts present in most fruits and vegetables, that doesn’t mean it’s a healthier substitution for other sugars. The evidence from studies on humans is still pretty scant. However, in a 2008 study where 23 subjects got 25% of their caloric intake from either fructose-sweetened or glucose-sweetened beverages for 10 weeks, the subjects who drank the fructose-sweetened drinks showed signs of decreased insulin sensitivity (a sign of diabetes) and increased fat in their abdominal regions, especially around their heart and liver, which is associated with cardiovascular disease (here’s the study itself or a translation from WebMD). Fructose was initially thought to be advisable for patients with diabetes due to its low glycemic index. However, chronically high consumption of fructose in rodents leads to hepatic and extrahepatic insulin resistance, obesity, type 2 diabetes mellitus, and high blood pressure. The evidence is less compelling in humans, but high fructose intake has indeed been shown to cause dyslipidemia and to impair hepatic insulin sensitivity. So while probably harmless in small amounts, it’s certainly not a “healthy” sugar or a free pass to eat sweet things without potential/likely health consequences. I’ll do a follow-up eventually about the claim that you can use less of it because it’s sweeter. There are lots of conflicting claims about how much sweeter it is and how much less of it you use that I’m still trying to sort out. So far, I’m not at all convinced that the small caloric benefit is a reasonable trade-off for the risks of increased fructose consumption. I’ll also address one final defense: at least in some applications and to some palates, agave nectar may taste better. I admit to being a little skeptical, but a friend has promised to arrange a blind taste-test of mint juleps made with agave nectar, simple syrup, and a 50-50 agave nectar/brown rice syrup blend. That won’t happen until the national day of mint julep drinking, which falls on May 1, 2010 this year. So, until then, I’m going to take a little break from reading and writing about agave nectar. This entry was nearly titled “Things That Might Not Kill You In Moderation But Certainly Won’t Make You Any Healthier Vol. I,” or “Hydrolyzed, Refined Sweeteners Masquerading as ‘Natural,’ Whole Foods,” but those seemed a little unwieldy. They do, however, capture the essence of the argument: agave is nutritionally no better than most other refined sweeteners, including high-fructose corn syrup (HFCS). If anything, it’s probably worse because it contains more fructose than table sugar or HFCS. It’s also no more or less “natural” than HFCS—it’s actually produced in a remarkably similar process that was first used on the fibrous pulp of the agave in the 1990s. While, as its proponents claim, the higher proportion of fructose has enabled people to call it a “low glycemic index sweetener,” sometimes alleged to be safer for diabetics and recommended by weight-loss programs like Weight Watchers, recent research suggests that large amounts of fructose aren’t healthy for anyone, diabetic or otherwise. Given the choice between sugar, HFCS, and agave nectar, I’ll stick with organically-grown, unbleached cane sugar (evaporated cane juice) and organic raw agave nectar that are free of pesticides, herbicides, and chemical bleaching agents; not genetically engineered; and still retains some nutrients, as well as being vegan. Since HFCS is not available in organic form and is highly processed, I would never use it. But agave nectar is just as processed as HFCS. Like most starches, corn starch consists of large glucose polymers—70-80% the branched, non-water soluble amylopectin and 20-30% linear, soluble amylose. Normal or non-HFCS corn syrup, like Karo, is produced by breaking those polymers down into their constituent glucose molecules using acids, enzymes, and/or heat. For the history buffs: the acid hydrolysis of starch was first discovered because of the 1806 British blockade of the French West Indies. Napoleon I offered a cash reward for anyone who could come up with a replacement for cane sugar, and a Russian chemist named Konstantin Kirchhof found he could produce a sweet syrup from potato starch by adding sulfuric acid. The same process was first applied to corn in the mid-1860s, and gained popularity in the U.S. during the sugar shortages of WWI (source: The Oxford Encyclopedia of Food and Drink in America). Sucrose is hydrolysed by brush-border sucrase into glucose and fructose. The rate of absorption is identical, regardless of whether the sugar is presented to the mucosa as the disaccharide or the component monosaccharides (Gray & Ingelfinger, I 966, cited by H. B. McMichael in “Intestinal absorption of carbohydrates in man”). Just like HFCS, agave nectar is produced by breaking down a plant-based polymer into its constituent sugars. In the case of agave, the relevant molecule is inulin, a fiber composed mostly of fructose units with a terminal glucose. Just like with corn and potato starch, there are different methods of hydrolyzing the sugars in inulin. Blue Agave Nectar uses a thermic process. Madhava uses an enzyme process, just like HFCS. Agave nectar is a newly created sweetener, having been developed during the 1990’s. Originally, the blue agave variety was used. This is the same plant used in the manufacture of tequila. During the late 90’s, a shortage of blue agave resulted in huge increases in cost and a sweetener based on this plant became uneconomical. Further research was done and a method using wild agave was developed. Overcoming the language barrier between the Indians able to supply the nectar from the wild agave on their land and the Spanish speaking local manufacturer was the key that finally unlocked a supply of raw material and has led to our bringing this wonderful new product to market. It’s true that the corn used in HFCS is less likely than agave to be organically-grown, but you can get organic-certified corn syrup from the same manufacturer as the blue agave nectar pictured above and nutritionally, the main difference between that, the HFCS used in most processed foods, and agave nectar is the ratio of glucose: fructose. The regular corn syrup is 100% glucose, HFCS is usually 55/45 glucose/fructose, and agave nectar 56-90% fructose, depending on the plant and the process. 4) in miniscule amounts, perhaps, but recent trials involving diabetics and agave nectar were halted because of severe side effects. This may seem like a strange thing to argue about, because the popular consensus still seems to be that juice is healthy. Jamba Juice markets itself as "the category-defining leader in healthy blended beverages, juices, and good-for-you snacks." They even use Jamba as an adjective to mean the opposite of high fructose corn syrup and trans-fats (adding those things to juice ""just wouldn’t be Jamba"), which again, constructs the brand as healthy vs. the demon poisons that make people fat. Even if it’s foolish to go looking for truths in advertising, I don’t think Jamba Juice’s branding generally occurs to people as a massive irony or lie. Advocates of banning or restricting soda vending machines in schools often claim that the soda should be replaced with 100% fruit juice with no added sugars, and for many people, a glass of orange juice still represents "part of a nutritious breakfast" strongly with desirable nutrients like Vitamin C.
But a number of health trends have begun cast suspicion on juice, especially the (impartial and incomplete) shift from primarily low-fat to primarily low-calorie and low-carb dieting in mainstream weight-loss culture, and the growing concern about the role sugars (especially fructose) play in personal and national obesity. On the low-calorie front, people who believe that losing weight or maintaining a healthy weight is all about the basic algebra of calories-in vs. calories-out often end up axing all caloric beverages from their diets because they have a bad satiety-to-calorie ratio—I mean, obviously, right? Fruit juice is just fruit with some or all of the filling fiber removed. If the goal is maximum satiety on minimum calories, you’re better off eating whole fruit and drinking water or artificially sweetened beverages. On the low-carb front, people who believe that what’s important is not how many calories you eat but what kind are also going to see juice (and sometimes most fruits and vegetables as well) as "unhealthy." It does seem to be true that diets high in carbohydrates drive up insulin levels, slowing metabolism and encouraging the body to store fat. And the overwhelming majority of the calories in most fruit juices are in the form of carbohydrates. Some green vegetable juices have protein content approaching 50% of the carbohydrate content, but that just makes it 75% bad rather than 100% bad, at least as true carbophobes are concerned. And finally, there are some non-carbophobes who might avoid juice because they’re wary of sugar qua sugar, rather than sugar qua carbohydrate. The carbohydrates in fruit juice primarily take the form of fructose—wikipedia has a handy chart of the kinds of sugars in common plant foods. It doesn’t seem like there’s a true consensus yet about whether or not fructose is especially bad—despite recent studies linking fructose to obesity, even within the medical community, some people still advocate fructose as a "low glycemic" sugar that’s better for diabetics. It basically all comes down to whether you think the fact that fructose is digested in the liver and doesn’t trigger insulin production is a good thing or a bad thing. To link it to other sugar purveyors: pro-agave nectar people should also think that fruit juice is healthy and people who think hfcs is bad because they think it’s "high fructose" compared to other sugars are, well, a) wrong, but b) should also be advocating hfcs-sweetened sodas over fruit juices, which are even richer in sugar. Personally, I think the evidence that fructose in large amounts causes equivalent blood sugar spikes to other sugar, increased "bad" cholesterol and triglycerides and signs of insulin resistance compared to glucose, and can cause non-alcoholic fatty liver disease consumed in vast quantities suggests that it is certainly no better and possibly much worse for human health than glucose or sucrose. But "worse for human health" is relative, not absolute, and depends a lot on amount, kind, and context. I’m generally convinced by the argument made by people like Gary Taubes that a diet composed of almost-exclusively proteins and fats might better represent the pre-agricultural, hunter-gatherer diet (as would cyclical feast and famine) and prevent carbohydrate-induced insulin resistance and fat storage. Jared Diamond makes some of the same points in Guns, Germs, and Steel. But the benefits of agriculture ultimately outweighed the costs—both for the species as a whole and measured by individual health metrics. In the immediate aftermath of the transition to agriculture, lifespans and average height decreased, but after a few thousand years, people depending on rice, corn, and wheat began to get healthier again. Does that mean carbohydrates are a healthier basis for a diet than proteins and fats? No. But it does mean that people can (and do) live very long lives uninterrupted by diet-based disease during which they are strong and energetic enough to physically do anything they want to do while eating a diet consisting substantially of carbohydrates. And I think that’s not a bad working definition of "healthy." It seems to me that the debate comes down to a difference between ideas about nutritional "health" based on what might be theoretically optimal (for a very limited set of criteria), ideas about health based on potential pathology, and ideas about health based on actual health outcomes. Fear of juice is based on the first two—the idea that either people should eat as few carbohydrates as possible in pursuit of some sort of optimal diet, or that the fructose in juice will cause fatness (an aesthetic problem, not a medical problem) or disease and eventually death. Based on actual health outcomes, I think it would be almost impossible to make a case for the claim that drinking fruit juice—occasionally or regularly—is categorically unhealthy or the direct cause of disease or death. In fact, things like fruit juice and hamburgers and Doritos, which can each be constructed as "unhealthy" are hard to entirely rule out of a "healthy diet." Even proponents of a soda tax generally agree that the only reason soda is a reasonable target is because it has no identified nutrients (what would happen if they fortified them, I wonder?). The nutrient-density of juice is the primary reason for the long tradition of juice being regarded as a health food. If your concern is about essential vitamins and minerals (like many older models of nutrition, which people like Marion Nestle stand by) or consuming carbohydrates for fuel, which many physically active people still do, it’s hard to argue with the healthfulness of juice. I agree with Michael Pollan’s claim that popular beliefs about health often fall prey to "nutritionism," or the attempt to reduce food and nutrition to scientifically-identified nutrients and vitamins. At the same time, I don’t think you have to be brainwashed by the continued prevalence of nutritionism to believe there’s good evidence that many of the nutrients that scientists have identified are actually valuable or promote health and well-being (even if they’re not the only valuable aspects of food). The person who requested this entry was concerned specifically about fresh juices being portrayed as unhealthy, because they seem to have been smeared by concerns about packaged juices being just other source of dietary sugar. While not all fruits lend themselves as readily to the production of refined sugars as sugar beets, some like apples, pears, and grapes can be turned into a nutrient-poor sweetener without most of the fruits’ color, flavor, or minerals and many fruit juices marketed as 100% natural fruit juices, like Juicy Juice, are sweetened with fruit juice that’s basically been turned into a sugar syrup. The nutritional distinction between those drinks and hfcs-sweetened soda is probably negligible regardless of whether your primary concern is calories, carbohydrates, sugar, or vitamins. But the reason packaged juices often combined with fruit-based sugar is that many fruit juices aren’t actually that sweet on their own, or their sweetness is offset by the intensity of the flavor, as anyone who’s ever tried 100% cranberry or concord grape or cherry or blueberry juice knows. The fresh juices you can get at juice bars or make at home are calorie-dense, but they’re also extraordinarily nutrient dense and not likely to be consumed in quantity or alongside meals. They’re more often enjoyed on their own, like a snack, particularly after a workout—basically just like fruit. When you leave in some of the pulp, it becomes even less nutritionally distinct from fruit, and when you include vegetable juices or the juices of things like wheatgrass and ginger which are difficult or unpleasant to eat raw, you may be enjoying something that could, by some criteria, be healthier than a piece of fresh fruit. Ultimately, while I don’t think even the occasional hfcs-sweetened Capri Sun is incompatible with a "healthy" diet and life, I think it’s unreasonable to conflate fresh juice without added sweeteners with juices sweetened with refined juice-sugar. I guess people trying to eat an "optimal" diet a la Gary Taubes should avoid all juices, fresh or no, but I don’t envy them their carbohydrate-less life, nor am I convinced that the total deprivation of many foods that have aesthetic, gustatory, social and/or cultural value is necessarily "healthy" or "optimal" either. For the vast majority of people who think fruit and vegetables are part of a healthy diet, fruit juice and especially fresh fruit juice should also pass muster as a "healthy" choice especially when consumed in moderation, which I suspect fresh fruit juices usually are. Confession: I not only avoided high-fructose corn syrup (hfcs) until about a year ago, I was actually skittish about fresh corn for a while after my first encounter with Michael Pollan in The New York Times Magazine (or it might have been this article). I stopped eating corn tortillas and frozen corn kernels and felt vaguely panicky about the possibility that I was consuming hfcs in condiments and sandwich bread when I ate out, even if it would have only been tiny amounts. Now that I’m over it, I sometimes have a hard time remembering what was so scary about the idea that there was corn in everything I was eating, an idea that was obviously ludicrous anyway because I was a vegetarian who mostly ate food prepared at home from whole, fresh, non-corn ingredients. But looking back at the articles linked above, they are pretty ominous. Even though Pollan notes that a corn-based diet has been the norm in Mexico for centuries without any apparent ill effects, and the story he tells about the "cornification" of the American diet is too complex to be a nefarious plot designed to kill us all, it’s clear that he thinks the amount of corn Americans eat on average is a Bad Thing. Sure, it may rely on innocent accidents of nature, like the uniquely efficient way corn fixes carbon during photosynthesis and and the great distance corn pollen has to travel to reach the style, but it’s also reliant on much more insidious developments: synthetic pesticides and fertilizers, an arcane federal farm subsidy systems that turned corn into "a welfare queen," agribusiness giants with seed patents on genetically-modified strains, giant livestock feeding operations that use antibiotics to keep cows alive because eating corn makes them sick, and food manufacturers who profit from getting people to buy cheap food in ever-increasing quantities. Eating corn in any form may seem like a way of giving in to all of that or even supporting it. So although I did a fair bit of eye-rolling when I read about people avoiding sweet corn at their farmer’s markets this summer or feeling "corn guilt" when they eat popcorn, it’s worth remembering that I was one of them not so long ago. It’s not that many of those concerns are invalid—it’s true that most corn relies on a lot of synthetic fertilizers and pesticides, that much of it is grown using genetically modified seeds with patents held by huge corporations that have been known to sue farmers when corn with their patented genes end up in their fields, that cows fed diets of corn get sick and are more susceptible to diseases like e coli that can threaten humans. But it’s also far from clear that refusing to eat ketchup containing high fructose corn syrup is an effective means of changing any of that or even primarily motivated by the desire to change those things. Although people like Pollan have made a big deal about corn sweeteners being artificially cheap due to farm subsidies, the actual farm cost of hfcs in the food products we buy is so minimal that even if subsidies were eliminated entirely, it might not affect portion sizes or consumer demand at all. Even in soft drinks, which are by far the most demonized hfcs delivery system, hfcs represents just 3.5% of the total cost of manufacturing. The corn content, the only part actually affected by farm subsidies, is only 1.6 percent of the price (based on US Department of Commerce data). A comparison between the U.S., Australia, the UK, and France, all of which have different sugar policies but similar consumer prices, show no pattern in the relationships between how cheap sugar is, how much of it people eat, or how fat on average they are (which most people wrongly assume is a reliable measure of health outcomes, but I’ll tackle some other time). Pollan’s formal case against hfcs relies primarily on arguments about price and prevalence, but that doesn’t really explain the kind of paranoia his books and articles have helped inspire about eating corn and/or hfcs. Not buying and eating something because it’s too cheap just isn’t the kind of consumer behavior that spreads the way hfcs-phobia has. Nor is this some sort of mass avoidance of all added or refined sugars, or brands like Snapple and Pepsi wouldn’t be running huge campaigns to advertise soft drinks containing only "natural sugar." Instead, people have latched on to the implication, which isn’t supported by any data I can find, that hfcs is nutritionally worse than other sugars. The hfcs paranoia isn’t caused by the idea that hfcs might be unwisely or unfairly subsidized or that pesticides used to produce corn are poisoning waterways or anything related to feeding corn to cows. The fear is that hfcs might be some kind of demon poison that makes people fat. Some research has suggested that consumption of high-fructose corn syrup, used as a sweetener in a wide variety of foods, may increase the risk of obesity and heart disease. Now, a controlled and randomized study has found that drinks sweetened with fructose led to higher blood levels of L.D.L, or "bad" cholesterol, and triglycerides in overweight test subjects, while drinks sweetened with another sugar, glucose, did not. The study did not test high-fructose corn syrup, he said, and judgments should not be made about it from the findings. Not that that stopped the author from leading with the useless, ambiguous claim about a supposed link between hfcs and obesity, but surely this deserves a little more attention: yes, fructose alone seems to cause more insulin resistance and weight gain in both rats and people than glucose alone. But high fructose corn syrup is only "high fructose" relative to normal corn syrup, which is 100% glucose. The kind of hfcs used in most food processing, including soft drinks, is hfcs-55, which is approximately 55% fructose and 45% glucose, or almost identical to sucrose, which is about 50/50. Another kind, hfcs-42, is used in the manufacture of some baked goods, and if fructose is really worse, that would make that kind of hfcs healthier than cane sugar. Indeed, studies comparing the consumption of hfcs to sucrose have shown no differences in metabolic responses (or energy or macronutrient intake) at all. It’s probably no coincidence that the wholesale switch to corn sweeteners in the 1980’s marks the beginning of the epidemic of obesity and Type 2 diabetes in this country. Of course, this fails to account for the simultaneous increases in obesity in many other countries, perhaps most notably Australia, where obesity rates rival or even exceed those in the U.S., but sugar is the primary sweetener. It’s not that he’s totally wrong; it does seem probable that U.S. farm subsidies and the cheap price of highly-palatable, nutrient-poor, calorie-rich, primarily carbohydrate-based foods is one factor driving the relatively small increases in the average American’s weight since the 1970s. And the history of corn cultivation and agricultural policy has something to do with that. But there’s no reason to think that hfcs is uniquely responsible for the "obesity epidemic." After all, if it weren’t for subsidies and tariffs that keep the price of sugar artificially inflated, which are the result of a different set of biological, historical, and political contingencies, it would be just as cheap. Ultimately, hfcs is just another source of sugar, nutritionally no different from cane sugar, and way better than agave nectar if you’re concerned about fructose. It might be slightly worse than things like honey (esp. raw) and maple syrup (esp. grade B or lower) if you’re interested in vitamins and minerals. (This is all assuming the hfcs in question contains mercury, but that’s sort of another story altogether). That doesn’t mean hfcs is "natural," a word which has virtually no meaning when it comes to food labeling anyhow, but then, if "natural" is the alternative to "processed," no sweeteners are. Agave nectar must be filtered, hydrolyzed, re-filtered, and concentrated before it can be used as a sweetener. Refined cane sugar is purified with phosphoric acid and calcium hydroxide, and sometimes whitened using bone char which is why some vegetarians and vegans refuse to eat it. The upshot is there’s no reason to believe that hfcs is any worse for you than sugar or much worse for you than any other sweeteners, and there’s certainly no reason to believe that a little bit here and there in a favorite condiment or even the occasional soda is going to hurt you. Later in this series: I’ve gotten a request to weigh in on fruit juice, and will try to do that soon. And someday I’ll get around to msg, as promised before.